Terrence J has found himself in a whole mess after his luxury McLaren was found balled up on the sidewalk. We told y'all the actor/host's car was found abandoned and wrecked in the Studio City section of L.A. just after midnight on Tuesday and he was nowhere to be found. It was originally reported that his longtime girlfriend/model Jasmine Sanders was the woman witnesses saw with TJ when he hopped in an Uber after the crash. But, that notion has since been debunked. It def wasn't her. However, there was a female with him (allegedly wearing a blue jumpsuit) who has yet to be identified. Now, it's being reported TJ (real name Terrence Jenkins) is trying to get his wrecked $300K luxury car back, but police aren't giving it to him until he spills the tea on what happened. And the fact that it's still part of an ongoing investigation. Sources tell TMZ that the former "106 & Park" host DECLINED to be interviewed by the police as part of the investigation. Hmm...what exactly is he hiding? We're not sure. But it's clear he wants nothing to do with the investigation. Not only that, there are conflicting stories about WHO was actually driving the vehicle before it lost control, hit a parking meter and stopped against a tree. Now, witnesses are saying Terrence was the one who got out on the driver's side of the car following the crash. Earlier, witnesses said Jasmine was driving. 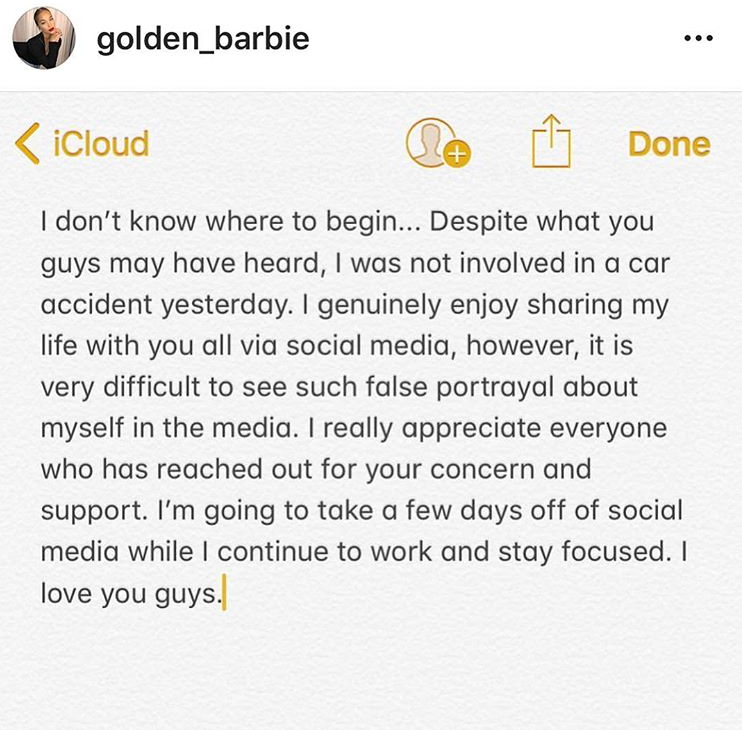 After Jasmine's reps issued a statement, she herself hopped on social media to confirm (again) she was NOT in the car with Terrence when it crashed. "I don't know where to begin...Despite what you guys may have heard, I was not involved in a car accident yesterday," she shared with fans on Instagram. "I genuinely enjoy sharing my life with you all via social media, however, it is very difficult to see such false portrayal about myself in the media." "I really appreciate everyone who has reached out for your concern and support. I'm going to take a few days off of social media while I continue to work and stay focused. I love you guys." Meanwhile, all of Terrence J's social media accounts have gone radio silent. We can think of a FEW reasons why the former "E! News" host may not want to speak with police. What do y'all think REALLY happened? PREVIOUS: Kanye Meets With Trump, Again - Is This Y'alls Uninformed, Misogynistic, Narcissistic Rap King? NEXT: EXCLUSIVE SNEAK PEEK: 'GUHH:ATL' Star Jhonni Blaze Can't Seem To Shake The Ratchet Antics, Gets Into A FIGHT Before A Performance!